The Grey Area of Mute Records has undertaken a reissue programme, releasing the pioneering recordings of groups and individuals associated with the industrial / experimental music genre on CD for the first time. In this interview John McRobbie, the man behind this ambitious reissue programme, explains the motives for its formation, the problems encountered and discusses the state of "industrial music" today. Additionally, he informs us of what The Grey Area has planned for the future both musically and visually. compulsion: What was the idea behind setting up the reissue program? It was never a direct idea, it just sort of happened. I needed a job, Daniel (Miller) and Mute required someone to look after some of the catalogue items, because Mute being a contemporary label requires effort to deal with catalogue items. We picked up Can, Cabaret Voltaire and we had dealings with Throbbing Gristle - and getting that deal together took a long time. It was a matter of just concentrating on it and I found it was far more enjoyable than dealing with contemporary music. So I developed it. compulsion: How far is Daniel Miller involved in this? He's involved in that he's funding it, although it is now self-sufficient - I hope. He picked up Can and Cabaret Voltaire; two bands he very much admired and he worked initially with Throbbing Gristle. So it was a way of involving himself with material that Mute did not have a direct connection with at the time, but would love to have done and I suppose the main parameter is to develop it from that. I got interested in other things that were around at the time like Industrial Records for a starter - that was quite phenomenal. compulsion: You've been quite fortunate in being able to select what to reissue? I suppose so, but it just developed. It's not a matter of sitting down making a list of artists, then going after them, it was more a case of "God, I remember that one". Daniel happened to mention one day "What about the Industrial Records single SPK did?". So I traced it around and found that none of their records had really been out on CD before. I eventually met Graeme Revell and we put together a package for him and we'll be doing 5 albums. . .
compulsion: Any new material on this? Well, The Grey Area is not a contemporary label; there will be new stuff in the sense that it is previously unissued. But not new in the sense of 1992 recordings. compulsion: With the growth in the so-called industrial music scene, such as Nine Inch Nails and Ministry, Mute could be accused of trying to cash in by releasing the earlier and pioneering recordings. . . I think that they can be accused of cashing in on it. 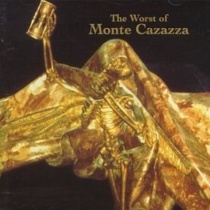 People using the term "Industrial", I think when Monte Cazazza and Throbbing Gristle coined it, it meant something quite different to what the industry chooses to interpret it as now. I don't think industrial has anything to do with dance, ambient or most of the contemporary bands around today. What interests me about bands like Ministry and Nine Inch Nails whose records I've bought and enjoyed ... but I don't see the pure connection with Throbbing Gristle and Cabaret Voltaire in the early days, or SPK. They've missed the point; the industry in coining a term, of a type of music that was never controlled by the industry back then. Punk got diluted as the majors got involved, Industrial never did that, it kept away from the mainstream. But now the bands that pretend or are lumped under that banner have nothing to do with it. For me, it is the purity of the earlier bands. Cashing in - I suppose they're creating an interest, which is good. You can't help noticing the references (especially NIN) Yeah, NIN quoting Throbbing Gristle lyrics uncredited, but in interviews they do mention Cabaret Voltaire and Throbbing Gristle and for people hearing these bands for the first time or reading about it, it creates an interest. They can go back and hear what influenced them. It's not cashing in. I see it as compensation to the people that really deserved to make more of it at the time because money was tight and Throbbing Gristle broke up which probably heightened their profile, but they're not exactly in a strong financial position. Yeah, hopefully, that's the idea. I find it's nice when people write in and say they heard this for the first time based on recommendations. They think "Wow! I wish I'd been there, seen them around at the time" - it really must have been an extraordinary time. compulsion: The Industrial revolutions. Are you trying to give more than the vinyl equivalent by enclosing statements and documentation with the CDs? Well, where possible. There's always the danger of ... somehow, electronically reprocessing it, remixing or upgrading it. We've had to steer away from that but there has been a few cases where they couldn't find the original master tapes or they've been in such poor condition that we've had to take it from the vinyl and that has involved going into a studio and removing all the clicks and vinyl deficiencies. When Chris Carter remastered Throbbing Gristle he kept in mind the CD medium and added extra EQ levels. I don't know what they are, but they sound great. I suppose trying to put together as much of the press, photos and memorabilia relevant to the time, to try and put it into perspective is a good idea. Generally, we try and reflect the vinyl equivalent as close as possible as we've done on "The Bridge" - Thomas Leer and Robert Rental, Dome. SPK are a direct transfer from the vinyl equivalent (of the master tapes), apart from one extra on "Zamia Lehmanni". Yeah, Fetish were legit. Mute actually licensed the Throbbing Gristle LPs in 1983. I don't know what the original ones were mastered from - hopefully the original master tape. The original master tape of "2nd Annual Report" was a cassette. So we have that wonderful thing of presenting a CD, a digital medium with something originally mastered on a cassette. We did that with Cabaret Voltaire, "Live At The YMCA" - which was a hand held recorder - it's a bit ironic, but it sounds great. compulsion: How strong are the sales considering the vinyl originals were pressed in such small quantities? This country is marginal. You really need to look at Japan, America, who have a very strong affection for industrial or this type of music. compulsion: That's something I've noticed with Death In June and Sol Invictus, it's always Japan and Europe. It's good to get press and attention in this country. But it's so rare. The press have become so narrow, so dependent on advertising and the people up above. It's lost. Seems to but there's been a growth in fanzines recently - which is a backlash against the so called bibles of the music industry. 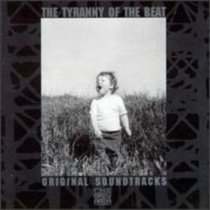 compulsion: With the release of compilations such as "The Tyranny Of The Beat," is this an attempt to reach a wider audience? Well the compilations are always difficult because any fans of the bands on it look at it and go "What did you put that on it for?". Hopefully somebody who knows and quite likes Throbbing Gristle will pick this up at a reasonable (mid-price) price and hear something at the other end of the spectrum like The Boys Next Door, or hear NON or Can - who all the bands on it were influenced by. It's a sales gimmick, really, to make people aware of the rest of the catalogue. compulsion: How limited was the video package? In the world around 3000, in this country around 300. Good, thank you. We could have made more but I like the idea of having something limited, and ensuring you do make it limited. I mean some of the early Throbbing Gristle stuff was exceptional and expensive to do, but now the value is there and it shows. As long as the value keeps up, it gives a nice feeling to find something in Record Collector fetched 50 pounds. compulsion: If you've got it! I suppose you can now get them on CD for around 10 pounds . . .
That's another thing I don't want to do. There were a few Throbbing Gristle items that are out and are now very rare. To try and put it out exactly as they were somehow takes away from the people who were there when they originally came out. Like, I could do the badges or the T shirts that TG originally did. We could easily redo these but we won't. compulsion: You are producing a TG t-shirt, though, aren't you? Yeah, but that will be a "flash" design. We won't do a design they originally did. It's good to keep those as history and as valuable. compulsion: While we're talking about limited editions. Are you going to delete the CD's or keep them available? The CDs will be kept available. I can see the vinyl being deleted at some point as the market is diminishing. It's like Mute they don't delete anything. It's an open catalogue. compulsion: I take it you need permission from the artists to release the recordings. How difficult has this been? I've only dealt with the artists - not any third party except for SPK and Monte Cazazza. Although I do speak to both Monte and Graeme through their label Side Effekts. The most difficult was Throbbing Gristle, having split-up they were not really talking to each other. In which case you had to make several phone calls to get the same point across. That took from 1986-1990 to really sort out. It was a great day when I got the signed contracts. compulsion: What about Monte Cazazza, in the RE/search "Industrial Culture Handbook", there was a statement from Monte saying he thought they were "flogging a dead horse" even by doing a book. So how did he feel about being classed in an industrial / experimental reissue program? I think to try and classify Monte at all is laughable. He's just, how would you describe it? The CD is brilliant and he's working on new material. There's also a Side Effekts live compilation due out this year. He's more involved in the visual art scene, doing films and exhibitions. He recently had something in San Francisco. He is keeping busy and he seems to be in good humour. compulsion: Is there anything you have wanted to release but not been able to? I have been after Neu, a German band, contemporaries of Can but they're still licensed to a German label and back in those days when contracts were signed, CD wasn't conceived of. So there's no CD rights. So they own the rights to the recordings but not the CD rights. We've got to get permission from the band and, like Throbbing Gristle, they have broken up and don't speak to each other and are unclear of how it should be done. So that's been going on for quite a while. I think it will eventually happen but mainly the two members of the band, and with Conny Plank having passed away a couple of years ago, the two remaining members need to get together and say this it how it should be done and hopefully Mute will be involved. Definitely the problem with Neu is that their record label reissued the albums and really took no time over it. The band were very unhappy with the presentation, art work and the sound quality - which is the big problem. They refuse to give permission to the CD in case it is fucked-up again. So when we approached it, I suggested we could originate all the artwork, remaster it and make the effort to make it the best possible presentation. But we couldn't acquire the rights from the company. compulsion: What's happened with the 23 Skidoo reissues ... they were mentioned early on and since then nothing? Yeah, very early on that was. That was a case before the Grey Area was anything substantial and I got embroiled in legal difficulties within Mute as to what we should do. It was to be a seven album arrangement. In which case I wasn't in control and didn't have the flexibility to offer them something and really negotiate, which I do now. I do my own contracts based on profit share. That was a case we let through our fingers. I'm hoping the 23 Skidoo material will appear but it's still unsigned. They were not aware of that, I had to tell them that. This is another problem with all of these, are we cashing in on the industrial scene. Laylah have without permission released the album and subsequently gone bust. So 23 Skidoo don't see anything from it. But there were so many brilliant labels back then, like Fetish. A brilliant label with some excellent stuff - but when it came down to it they couldn't necessarily pay what was due. It was good getting material out but proper compensation wasn't given where it was due. So hopefully we can sell enough, well Mute will recover the costs and the bands will see something of the reference back then. But I don't think any of the bands then would have been overly bothered about the financial side of things. Throbbing Gristle and Industrial would have had a good laugh and that is sadly missing from the bands today who claim to be industrial: that bit of humour and imagination. compulsion: Any more from Boyd Rice? Boyd Rice (NON) has a new album in a couple of months, "In The Shadow Of The Sword". He's had a few out on other labels (Boyd Rice & Friends, on NER - highly recommended!!!) and he's highly prolific and I'm hoping still to get "Pagan Muzak" out and some early Mute material. compulsion: How does he manage to record for other labels? It's a flexible arrangement. Boyd was one of the first Mute artists, so I doubt very much that he has a contract. But then Mute artistes are on a profit share and if we can't schedule it, or don't get our act together. Why not, if he's got the potential for release. He should do it. compulsion: Why did you decide to start the cinema presentations? Profile really. It's what we said about the press I find it difficult to get reviews outside fanzines' attention.It seemed like industrial culture is not just limited to music, but God there's films (a whole cultural lifestyle) an attitude, a business and lifestyle. 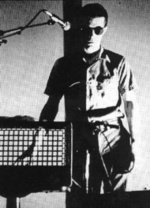 Throbbing Gristle made a lot of films, Cabaret Voltaire, of course, had their videos and Graeme Revell, his current career came from doing soundtracks to films. So it seemed the opportunity was to put on films. The original idea was to get live music with films playing in the background. Cabaret Voltaire hopefully will be doing a live performance. A new ambient album came out on their own label and they'll not be exactly playing that as it is improvised. We're trying to get the original "Johnny Yes/No" print. We've got Zoviet France doing a film, Cosey (Fanni Tutti) doing a performance and Monte Cazazza if we can get him over, or afford to get him over. We could set up installations in the foyer. He could do a presentation with slides and all the rest. It would be wild! compulsion: What about taking this around the country? It's difficult. I approached several other independent cinemas around the country that people had told me, could be interested. But I got no response. I think they have to see what the bottom line is and we'll have to prove it financially. That's always difficult. compulsion: Have they been well attended, as they sound interesting? They have been interesting indeed, but we've been getting the cinema crowd, which is not a bad thing as we try and introduce the music to them. We started selling cassettes for each show but that proved expensive. People who go to the cinema find it difficult to spend money on anything other than coffee or ice cream. It's a bit unusual. We bring in leaflets and books, and they pick them up read them and put them back and it's very polite. (The Leaflets) are done here, about the bands, anything relevant that people should know about. Temple Press were going to do a Throbbing Gristle Scrapbook. Originally, I went down to see Gen and they had a mock-up of it, I was going to get involved and put it out with a CD. But three-quarters of the band were not completely happy with the contents and I can't really impose changes or authorise it. It's a difficult position to be in, playing Devil's Advocate, making sure all four are happy. Which is difficult. compulsion: What about releasing more videos? The Throbbing Gristle ones are out on Jettisoundz. There is lots more TG material that didn't come out. But you wonder when you've got to stop. We could have released every one of these 24 Hours Live Of Throbbing Gristle - there would be nothing legal to stop this. compulsion: Who is actually selecting and compiling them? We put them together, again it was Brian (Lustmord) from Side Effekts Records. He's a massive fan and he went through the 24 hours (not the same day surely!) and selected down to 4 CDs of 70 minutes each and we made up the list and sent them to all of the band members. They were all happy about it Gen thought - "Wow!". It's very difficult to be objective about material, but it was chosen on the basis of the best sound quality, performance by the band, the master tape quality. They were all on cassettes and were taken to the CTI studios (Studio 47) and Brian and Chris spent a week going through the original masters, putting them onto DAT, enhancing each one and the first to come out was on the "Tyranny..." compilation and this is representative of the quality of them. There are a lot of Throbbing Gristle bootlegs and each one dilutes the potential of the legitimate releases, which is part of the business, I suppose. 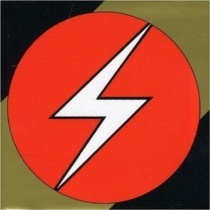 compulsion: The Throbbing Gristle catalogue has been reissued what about Chris & Cosey's? The Chris & Cosey catalogue on Wax Trax is finishing, but they still have an obligation with Play It Again Sam, who are putting it through Caroline in the USA. So I think the Chris & Cosey catalogue will remain available. Our involvement with Chris & Cosey is quite close, we asked them to support Depeche Mode but they felt their visuals would not be appropriate for a Depeche audience. compulsion: What sort of presentation would you want Cosey to do? Well she put together a package for Wax Trax called "Time To Tell", which was never released. (This was released via Ian Dobson's Flowmotion magazine in 1982/3 - I think) It's a strong possibility we could be doing that, and slides from Coum Transmissions through to Chris & Cosey. She's got a clear approach to her role, in a broader scale of the role of women in the business. A refreshing approach. You would think someone who made a living stripping would have it completely different to what she does. I think it would be a very entertaining evening. compulsion: Finally, where do you think the Grey Area will lead? www.brainwashed.com/axis Archive material on Coum, TG, Cabaret Voltaire, Monte Cazazza etc.